reason being: i am going to be moving into a new apartment the end of this month, or as soon as construction is done, and i need to save up for all the furnishings i plan on getting and also... i am partially funding the construction. you sell pretty things. i love pretty things. therefore, you and i are really a match made in heaven. except... sometimes the prices are a wee bit out of my range. so imagine how excited i was when i noticed you were having a sale on all bath accessories. i am renovating my bathroom! how did you know? i swear, we must be soulmates. 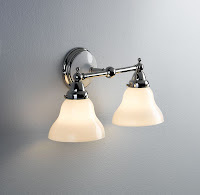 i ordered the haines double sconce yesterday. i selected expedited shipping. thats supposed to be like, next day shipping right? well, i ordered it late in the day, so im assuming it will be next day starting from the next business day... which is today. so i should get it tomorrow, no? but, restoration hardware, i have not received a shipping confirmation email, like your website says i would. so i call customer service and what do they tell me? ITS NOT EVEN SET TO BE SHIPPED OUT OF THE WAREHOUSE UNTIL 1 OR 2 BUSINESS DAYS AFTER TODAY! that is NOT expedited shipping! i hearted you, restoration hardware. but now i am feeling anger towards you. and resentment. i feel lied to. i dont think i can ever trust you again. i think we should see other people. shipping and handling has always been shady business. viewer ship but i think you've done a great job. awesome! and i dont think i need to tell you this.. but.. i just thought i had to..
interest you.. my request to you would be to put our website link on your blog page.. or write about us with our website link on the article..
if we interest you of course! in the mean time keep posting! good post, do you want to swap links? i inform you about Islam acording to Islam. Peace to all who follow hidayath (guidance, the correct path)! Islam…for whom? For every person upon whom Allah has bestowed life and intellect. For those who can see the blessings of Allah. For those who can hear the Words of Allah. For those who can comprehend the evidences of Allah. For those whose hearts are full of love and gratitude to Allah. For you, for me, and for those whose blessed hearts are open to faith in Islam. I invite you to Islam for your eternal happiness. Eternal felicity, salvation and peace are in Islam. Goodness and light are in Islam. I just want to warn you at facing to terrible penalty. There is no compulsion in Islam and I don't force you. Because Hidayath (İslam:the correct path) is distinct from error. Allah jalla jalaluh is An-Nur: He who gives light to all the worlds, who illuminates the faces, minds and hearts of His servants. Allah is Al-Haadi. He who provides guidance. The true guidance is light from Allah. You are at the Presence of Allah and you should alone invoke Allah that Allah illuminated your face, mind and heart (spiritual) and provided your guidance. Allah is Al-Mu'min: He who awakes the light of faith in our hearts. Allah is At-Tawwab: He who is ever ready to accept repentance and to forgive sins (Relenting)). Narrated by Abu Sa'id Al-Khudri (may Allah be pleased with him) - Allah's Messenger (pbuh) said, "If a person embraces Islam sincerely, then Allah shall forgive all his past sins, and after that starts the settlement of accounts: the reward of his good deeds will be ten times to seven hundred times for each good deed, and an evil deed will be recorded as it is unless Allah forgive it. 'Wouldst thou that thou shouldst be purified (from sin)? Human being certainly prone to evil unless my Rubb (Lord) do Bestow His Mercy). You never must submit Satan. Because satan great enemy for mankind. You should not submit absolutely except Allah. Because Allah is your Rubb (The Lord). Mankind should not obey own self desires, passions, feelings, prejudices and whispers of Satan. You shouldn't be one of arrogant and ignorant humans. Be resolute to enter Islam (the only true way, the Straight Way). Please you should not afraid of truth. I bear witness that there is no Ilâh (worthy of worship) except Allah (The Only One Almighty, Only One Rubb (Lord)) and Allah has no partners; and I bear witness that Muhammad is His abeed (servant) and Messenger. THE REASONS OF KNOWING ISLAM WRONGLY: 1- Unfortunately, Most of human exactly does not know Islam according to Islam. Most of mankind has lost its own sense faculties because those people are in comfort, amusement, has the passion of earn much money. Most of human is in being drunk of amusament, football, music, secularism, ideologies. Sustanance and blessings are not favour of Allah. They are all handle of trial. Satan shows evil to Islam to Non-Muslims. By going through the teachings of Islam, it is clear that such a religion has only come to benefit mankind - not to destroy it. So why is there so much hatred for this noble religion in the West? The answer is simple, the media. It is the Jewish influenced media of the West which has portrayed Islam to be something that it is not. Those are who wanted to deceive human beings, always attack Islam. With regret, some people knowingly change translations of Holy Qur'an. This unkind behavior causes that some people can misunderstand Holy Qur'an. Learn Islam from true sources. Islam have illuminated universe. Islam is the soul of universe. Some people can not understand Qur'an and completely can not profit by Qur'an since they have not belief in hereafter. Belive hereafter acoording to Islam. 2- Most of men approached with prejudices, glasses of horse and in a deviation. However If they had not approached with prejudice, bigotry and idea obsession. they would have understood Islam. Some of men understand completely way of life is a great problem. This idea is not valid for Islam. This idea is a conjecture and fictitious. Islam presents Divine Laws that guide all aspects of life by distinguishing right from wrong." 3- Deeds of hypocrites who are the one of the greatest enemy of Islam. 4- Most of men confuses with Muslim and Islam. Islam is excellent. There is no fault in Islam. Muslim is a Human being. The Human being can mistake. Islam doesn't want to commit a sin, make a mistake. Mistakes, crimes, sins never attribute Islam. There is no a community of representation in Islam. Communities never represent Islam. Muslims only serve Allah with utmost sincerity. 5- Muslims exactly did not submit Islam with a great sincerity. Most of governments usually did not govern according to Islam. Some Non-Muslim president want to control Muslims and make Muslims in slave for destroying Islam with their all powers. Some imperialist president, missionaries and Zionists exploit for own self benefits wealthes of the countries that Muslims especially lived. 6-The effect of Islam had not showed in Europe in spite of paths of tasawwuf (Sufism, mysticism). Tasawwuf is a false way and exlectic structure. This is Bid'ah (innovation) related to belief. Tasawwuf is not existing in Islam. Islam is not tasawwuf. Muslim belive Islam and not believe Tasawwuf. Islam is never been synthesized with any philosophy and any ideology. Islam rejected all ideologies.